You’re Invited to Made 4 Math Monday BLOG Party! What a fun afternoon on Twitter – party planning! What’s better – no worry with what to wear, no massive food prep or making sure the house is in order! This will be the event of the year…wait – of the week! Every week! Yes! You are invited to our “Made for Math Monday” BLOG PARTY! It all started when @druinok discovered Pinterest a few days ago – and ran across a post by Tara over at 4th Grade Frolics. I am always overwhelmed by the amazing creativity of Elementary teachers. Wow. Tara’s Made It Monday Linky has inspired a group of teachers on twitter to make something creative for our classrooms and share our completed projects! So, here we are! This Monday, @druinok will begin our “Made 4 Math Monday” BLOG PARTY! Be there or B^2! Find an idea / lesson / project – something you want to make / use in your classroom. Follow through! Make it / organize it! Blog / Share your project – include pics, list of supplies, directions and most importantly – share your resource – who inspired this project! When you tweet your post use #Made4Math or share a link to your blog post in the comments at Introducing Made 4 Math Monday with @druinok! These are great! Thanks Tara for sharing!!! And thanks @druinok for agreeing to do this!!! Who knew Kool & the Gang would make Yahoo famous before Yahoo even existed!!! #lit4math – Literacy Strategies for Improving Mathematics Instruction by Joan M. Kenney, Euthecia Hancewic, Loretta Heuer . You can read (here) how I am not a fan of writing and words. Literacy – communication – its all the same, in my opinion; You can read, write, speak – but its all to share/get information, right? I do realize the importance of providing students with strategies that will help them succeed, to give them opportunities to write and talk about their thinking can be a key component in their learning to help expand their understanding of certain concepts. I look at this chance to learn about literacy in math as a way I can learn with my students – to be open that words are my weakness – but by facing my fear – something I struggle with – I can help them realize words are not the enemy either. I am able to help them learn this “new language” called math and share ways of conquering it ! Though this book did not end as strongly and wow! as it began, it was worth my time. Chapter 1 really pulled me in, causing me to think about my classroom, questioning some of my strategies and left me craving more! It showed me how students – who are not as math-minded – can struggle because they view concepts differently. Chapters 2 and 3 – gave me tools / suggestions of ways I could provide students with opportunities to share – ways I could become more aware of their thinking – and prepare for their struggles. Through our chats, I was able reflect how I could improve things I am currently doing – but also looking at new ways of viewing mathematical text and ideas (literacy really isn’t a 4-letter word). The remainder of the book, well, I was diasppointed – but would still recommend at least a skim – because there are some key ideas – but mostly, some great articles/research mentioned you may wish to take a look at as well. I’ve linked to catalog from Storify of our Twitter Chats – again, some good thoughts – good articles and links. Also, take a look here, Teaching Statistics Blog offers some reflection with posts from reading the book in 2010. All in all – it really boils down to becoming aware of those struggles students will encounter and being ready to help them bridge past that struggle. Notice I didn’t say be the bridge – productive struggle is a good thing. We must give them opportunities to read, write and share – expanding their understanding by listening to other learners. When they write about their thinking – cognitive demand is much higher. We must listen to their conversations – not always answering their questions, but providing them with questions that will move their thinking deeper. When they talk, discuss, even argue over a solution – they have greater opportunities to build connections as opposed to a sit-n-get teacher centered classroom. Going along with @approx_normal ‘s #matheme I’ll show you mine… too funny. Although some of the convo going on with twitter past couple of days – makes me a little skert about meeting some of these people at math camp in just a few weeks! Welcome to Room 148…there’s always a Cloud of Kindness in here! My roommate, when I lived in Bardstown, used the phrase in her biology/science classes, and well, like anything good – I use it for educational puposes. 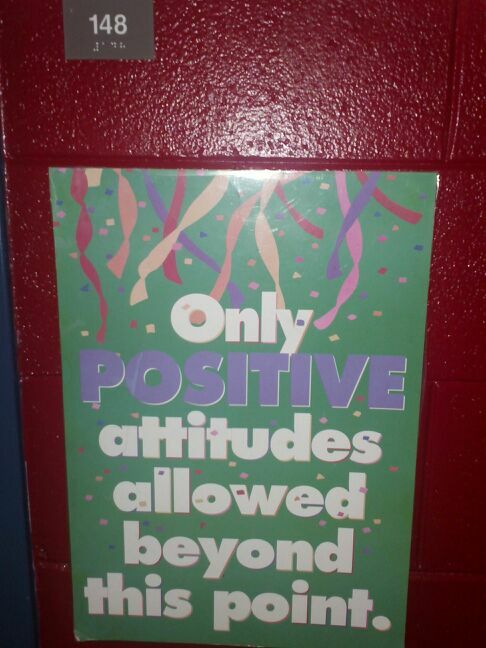 I begin the year by asking the students to leave the issues with one another at the door – they are welcomed to pick them up as they leave – but while in class, well, Algebra can be tough enough on its own at times – we don’t need any extra troubles slowing us down. Looking toward the door – you can see the student table – where I leave desk supplies – stapler, tape, hole-punch, kleenex and baby wipes for the students to use – to keep them away from my stuff on my desk. I have 2 sets of shelves – one is to turn work in, the other is for “while you were out” slips / daily handouts, etc for absent students. You cannot see this – but the shelves have color coded stickers on them. 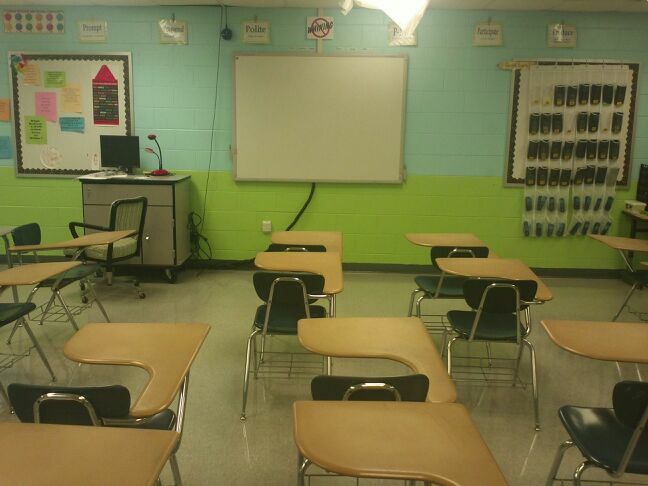 Each class has a different color – I place quizzes, writing samples, assessments etc. in the appropriate color folder to keep separated. Students know which shelf is theirs based on which period they have me. I have folders on my desk to file missed assessments. I keep color magnets hanging behind my desk – to place important reminders. Even my index cards I use to call on students – names are written in their class color. To the right of the door, you’ll see a long strip. Several years ago, I read an article that stated students sometimes processed integers better on a vertical number line. I got a pack of blank calendar cards – like primary teachers use – wrote out the integers from -15 to 15; taped them together, laminated and hot-glued them to the wall. (If you haven’t figured out – hot glue peels right off block walls) As we review integer rules – I refer to this a lot. You can observe students looking that way to use it quite often. Even in ESS, an upperclassman who struggles in math – said I wish I could take that thing with me – I explained, all you have to do is draw it on your paper. We were chatting about error analysis the other night on twitter – using exit slips to begin the following day. At the edge of the white board, you’ll see my stop light – self assessment folders. Green – I’ve got it! Yellow – Almost there! Red – needs some help/have questions. Students place their “target quizzes” in appropriate folder as they leave classroom. I’ve also done this with post-it notes, they place their names on back of post-it note – tap it on the board as they leave…great visual for me to see if I need to address things again tomorrow. One question the other night – do “red” students get embarrassed – not really. Often they have been absent – or just need some extra one-on-one – this is a simple way they can communicate with me. I thought the same thing when I first did this years ago, I was actually surprised at how many are okay saying – I’m yellow and need a little more practice/help. 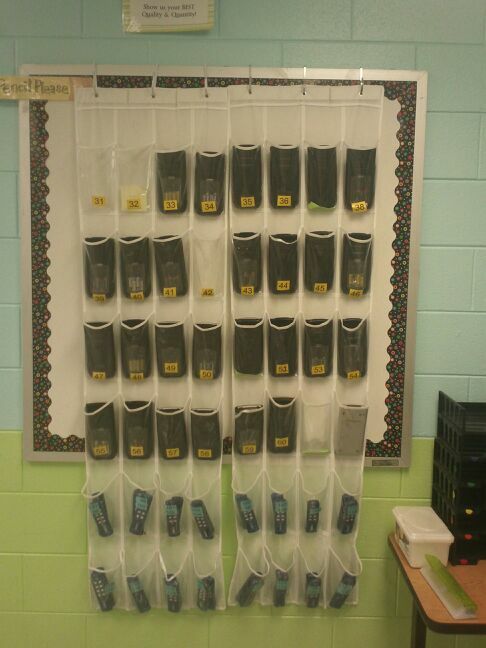 Hanging shoe-organizers house a classroom set of TI-84s and CPS (eInstruction) remotes. TIs have #s engraved on the back, so I printed #’s and attached them with clear packing tape to the front of the compartments. Yes, students still place them in the wrong slot occasionally. Placed strategically so they can pick it up as they walk in and drop it off as they exit. 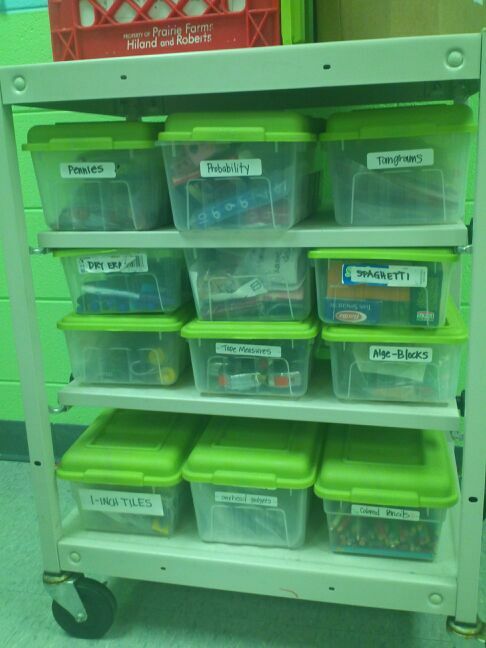 I love my little cart on wheels – it stores several “lab” materials such as pennies, spaghetti, dry-erase markers, colored pencils, tangrams, algebra tiles, tape measures, 1″ squares, probability items. If I need a flat surface to demonstrate a lab or something else, I wheel this over to front of room. One thing I forgot to take a snapshot of were my clothespins on the wall. Hot – glue closepins to wall, wherever you plan to hang a poster or place a word-wall. Laminate vocabulary, posters, etc. and the papers are easily interchanged as needed. If you’re really cool, find a cute idea on Pinterest and cover, paint your clothespins to coordinate with your room. I have never been afraid to move my desk arrangment around. I have been known to change it at least once per month. However, the past couple of years, I’ve found myself liking this layout. 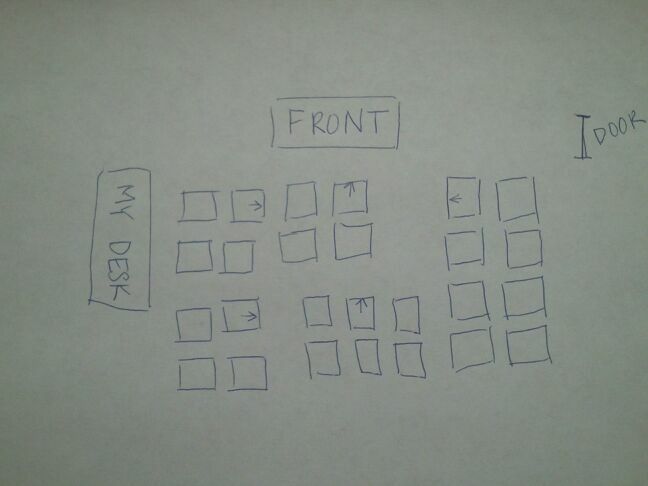 Not drawn very well, desks are placed so I can walk easily between the “groups.” I have students facing left, right and forward. 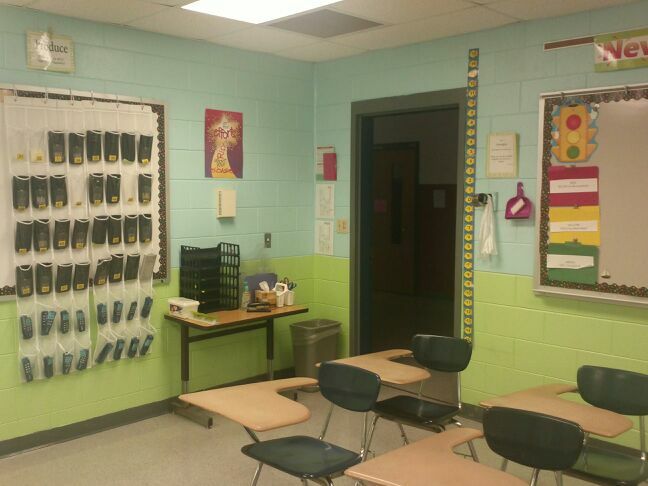 With this layout, I can easily pair students up person in front/behind. They can quickly move together in groups of 4 – with back center 6 often splitting into groups of 3. I have realized if I keep the same starting format, students are much quicker at rearranging desks correctly when we’ve completed our group activity. I keep students in assigned spots throughout a unit of study – so they are aware of their work-groups to save time. New unit = new seat & new group. Yes, there are only 26 desks – so grateful to have “small” classes compared to some of you. The last picture I wish to share is “the cabinet.” You see, I teach in our 9th grade wing. I have a huge foot on my door that states “The journey of 1000 miles begins with a single step.” I used to offer the question to my students on day one “High School = 1000 miles” True / False? Quite interesting the various strategies they would come up with to answer the question. On average, a student would walk about 1000 miles, usually a little over during 4 years of high school. Anyway, with our first group of Freshmen who came through “The DOCK” – we began making their little footprints with the sides of their hands and signed their names. Often times they’ll visit the week of senior finals to find their foot, even taking a picture of it. You can see, I’ve had to move on to a file cabinet. I guess I’ll have to break down and use my desk some day…assuming I stay put. I keep telling them I’m only doing it because someday, one of them will be famous – I’ll have their autograph and I’ll auction it off to make a little cash! I still have a geometry project from a infamous beauty queen…but that’s another story. I am always looking for ways to update and bring a little life to Room 148! I look forward to touring some other classrooms via the blogosphere! Thanks for stopping by! This past year, I was in the computer lab one day each week and most of my one-on-one help occured on these days. Hmmm. There were a few times I sent the WAA home with students – I learned VERY quickly, this was not very effective. Those who needed to reflect and analyze the most, rarely completed the assignment on their own and required being assigned to remediation to complete it. It needs to be during class time in order to provide help when necessary. This is something that needs to be included as I plan/pace for the upcoming year – a full day for test analysis. Within this discussion – what do you do with students who have mastered the content – those who only have a couple of items needing reflection/correction? I’ve heard of teachers who use these kiddos as “tutors” for those who struggle. Ehh. Not sure I like that one – too many times students are put in this situation and become frustrated, ending up telling the student what they did wrong and fixing-it for them, but no learning has occurred. Don’t get me wrong, in a well-thought, planned activity where students share their thinking, I’m all for it. Even occasionally, but I don’t want to make this practice the norm. I don’t want to “punish” them and require them to do only meaningless, busy work. Is it wrong to want to reward them with some type of a “fun” learning activity? I suppose I should research the idea of having an Anchor Activity List – for those students – give them options. But I ask myself – does it have to math related? For example, is it legitimate to allow them to read? Do Anchor Activities need to be assessed? Or can they simply be fun activities that require students to think? I don’t know what’s acceptable? I haven’t had this conversation before today. I realize its my classroom, and in the end, the decision is ultimately my choice – but for today, I wish I had a Curriculum Specialist / Administrator who I could set across from, share my ideas and let them ponder my options with me…questioning my reasons for choosing what I choose. How many options should I post? Do they need to be related either to current or upcoming unit of study? Or is my initial thought to provide a shelf of resources like these acceptable? Critical Thinking – Balance Math & More – get variety of levels for different levels of students. Have an index card file students can choose an interesting math topic to learn about – Pascal’s Triangle, Mathematical Quilts, etc. I understand in many classrooms that an Anchor Activity is one that students can go to when they have completed their work – but in my classroom, I could count on one hand how often their is down-time in my classroom. If its not an assessment day – we truly do go bell-to-bell…I’m not lying, ask any of my students! I will share more as I iron-out the details the closer we get to the school year beginning! In the meantime – feel free to share your ideas and insights! Please share your success stories & what you’ve learned from not-so-successful stories. 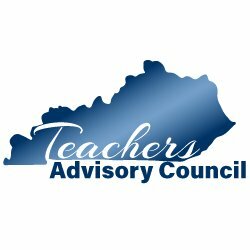 Suggestions – for middle and high school – ranging from ideas for different content areas – to Planning/Implementation/Scoring Guide. Short, sweet and to the point. Hmm. We went on to discuss different meanings and determined this one was because the dvd was part of a larger set. These past few weeks, I’ve been thinking a lot about writing and communicating in math class. Even with our first chat on Twitter #lit4math over Literacy Strategies to Improve Mathematical Instruction (Kenney, et al) – I was reminded there were many words students struggled with due to multiple meanings; however, this question from my 8yo really drove the point home. Let’s see…volume – in this situation it meant part of a larger set; my 8yo reminded me, its the level of sound we turn up or down to hear better; but in my mind all I think of is how much a container/object can hold, well, because I’m the math teacher. This conversation reminded me of the ELL student in #lit4math who thought “whole numbers” were numbers which contained “holes” when written, for example 6, 8, 9, 10. Since 6 had one hole, 6 would be odd; likewise, 8 has 2 holes, so it would be even. We can learn so much about students thoughts and understanding, if we will just take the time to talk/communicate with them about their learning, misconceptions and ideas. I found nothing on volume in a quick search of this resource, so I moved on to searching online for etymology of volume – do I settle that it has to do with the size of a book or scroll? Hmm. Still I am not satisfied. It looks as if providing quality literacy strategies will be an on-going event, learning with students as I go… taking time to develop understanding and address “new-to-students” meanings of words and concepts…in an effort to impact their learning. More than ever, I realize how important it is to take the time to plan and develop strategies for literacy in order to provide the highest quality and most effective learning experiences my students deserve. I look forward to learning and sharing more as the summer progresses on this topic. I am a bit anxious about next school year. We will have a new adminstrator and assistant principal. Change is good, but the unknown makes me nervous. Anyone interested in relocating to a small town in Kentucky? This position offers the opportunity to work with over 850 young, vibrant, creative minds. You will have the chance to lead a staff of motivated, driven teachers. As an added bonus, you will be in the back yard of one of the most beautiful recreational lakes in America, Lake Cumberland! Cares about students and has students at the center of every decision. Is a visionary- innovative, ready to take risks, creatively uses resources. Will lead and push our faculty beyond anything we ever thought we were capable of achieving! Will set high expectations for us and hold us accountable! Is willing to listen and question our decisions to ensure positive impact on student learning! Can walk into our classrooms, acknowledge what we are doing well but also make suggestions that will cause reflection, helping us continue to grow as educators. Is a life-long learner and leads learning at RCHS by example. Am I asking too much? I don’t think so. A wise person once commented… “if we always hire the best, we will always have the best to offer our students” …and that, in my opinion, is the bottom line. There is an assistant principal position posted as well. Looking forward to a new era and keep reminding myself…change is good. *this is not intended to be a reflection of past experiences with any administrator(s), only a wish- list for what is to come.